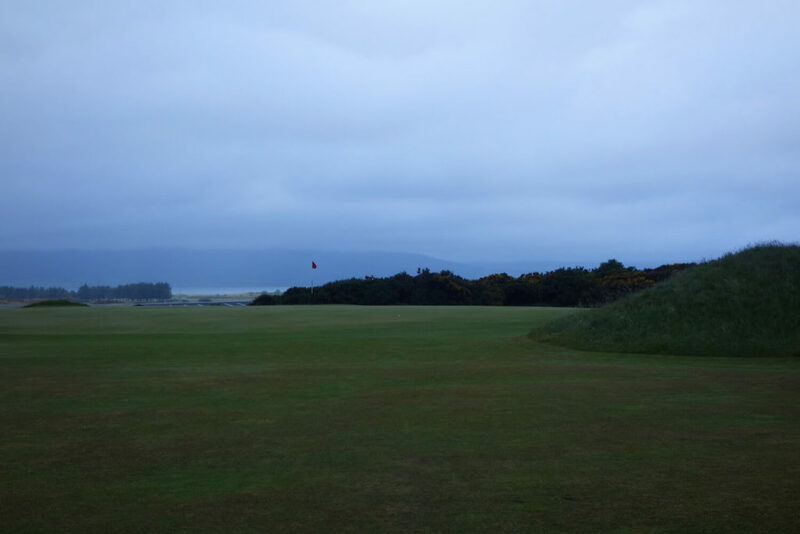 My two trips to Royal Dornoch couldn’t have been more different. My first trip was during my time at the University of St Andrews. A buddy and I took the train up from the Auld Grey Toon via Dundee, Perth, Inverness, and Tain, before catching the local bus from Tain into the town of Dornoch (a long day of travel). From there we walked a couple of miles to our B&B, where we stayed a single night on a whirlwind tour of the town (and then the same bus and train journey back home). 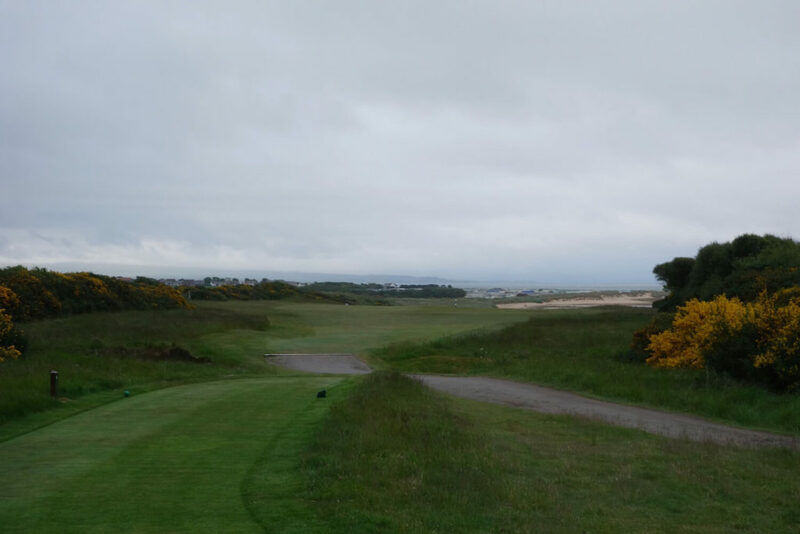 This most recent trip to Dornoch followed a weekend stay at nearby Skibo Castle. 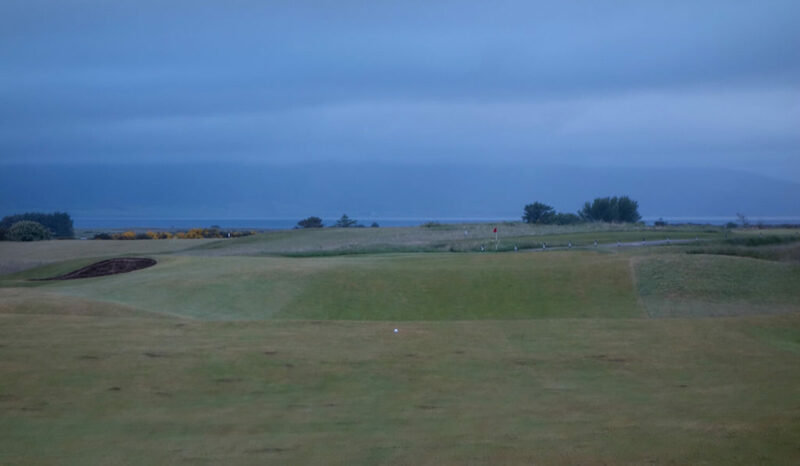 From there it was a short drive to Royal Dornoch in my rental car to the beautiful Links House Dornoch, a 5-star guest house within eyeshot of the first tee. Again, I only stayed one night before heading northward, but it was the lap of luxury. The constant on both trips was my plan for golf. Upon arrival each time I played an evening twilight round on the Royal Dornoch Championship Course and then played it again the following morning before departure. During both of the twilight rounds I had the course completely to myself and I think back on both as some of my most special times on a golf course. The place is so peaceful and remote, not to mention the quality of the golf is second to none. 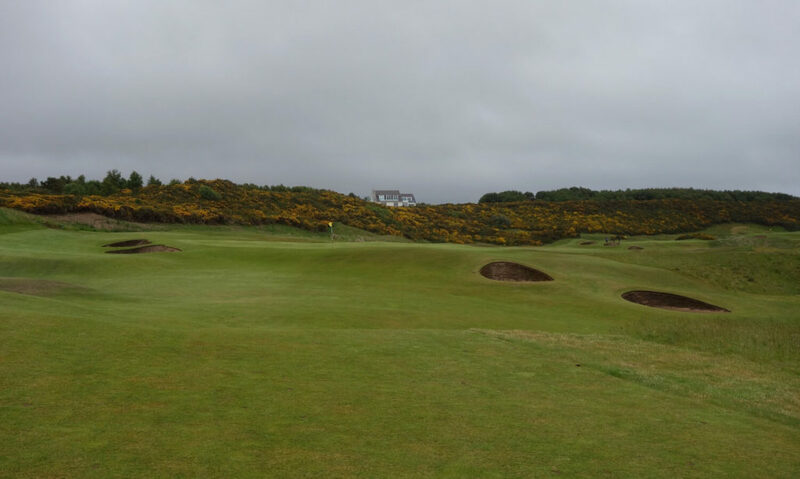 After four rounds at Royal Dornoch, I count it as one of my favorite links in Scotland. The town of Dornoch sits in the Scottish Highlands, located just far enough from any urban centers to feel remote. 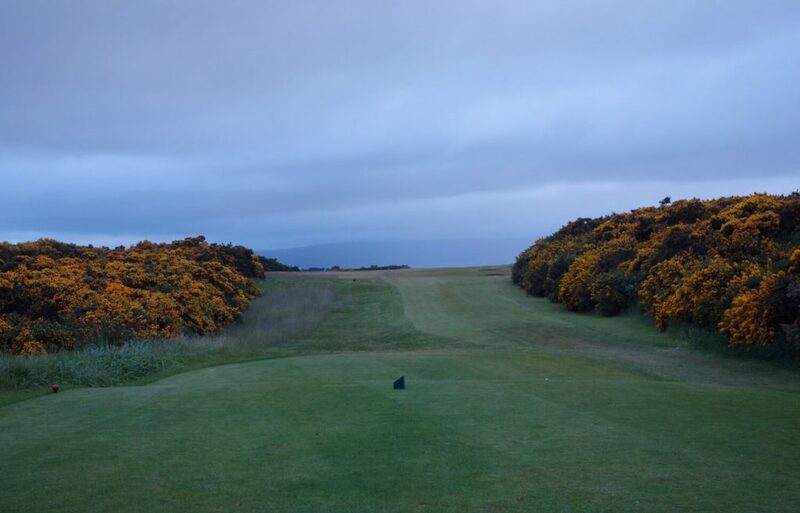 Inverness is only an hour away, but Dornoch has the charm of a place hidden from the rest of the world. 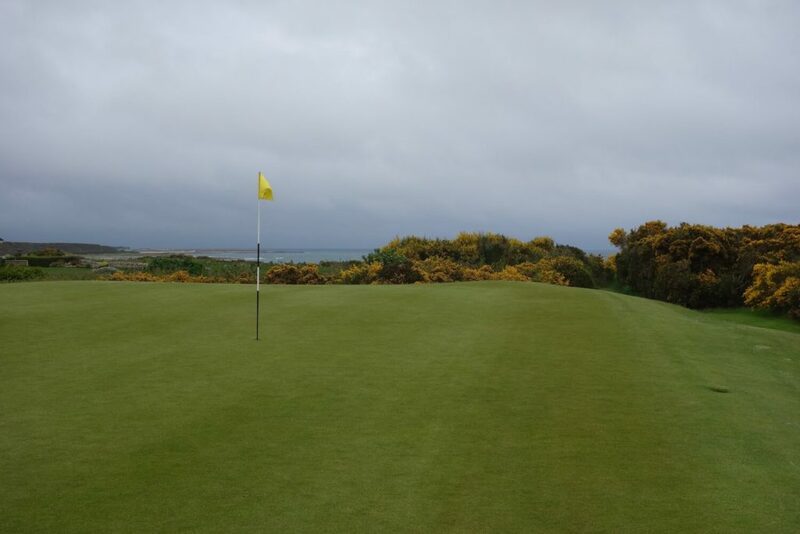 I highly recommend golfers stay in the Highlands for at least a couple of days if visiting Dornoch. The area is a treasure trove of charming villages and golf courses. Brora and Golspie are only 30 minutes north, Tain is just south, and for the adventurous, the entire North Coast 500 lays in wait. 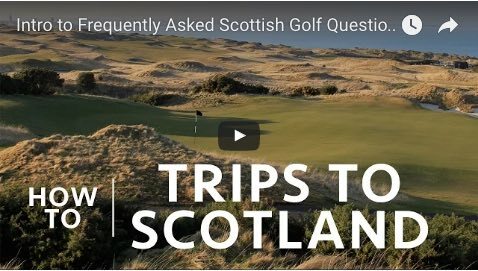 I spoke to a handful of local Dornoch friends who mentioned how often golfers ride into town on a tour bus, hop out to play Dornoch, get back on the bus, and head down south. That’s such a mistake and loss missing out on one of the most charming areas of Scotland. Take the time to enjoy the Highlands! Right in the town you have one of the best whisky bars in the world at the Dornoch Castle Hotel. You also have a fun lunch option at the Carnegie Courthouse, which was a derelict building rehabilitated by Todd Warnock, the owner of Links House Dornoch. Those are just an afternoon’s worth of activities in a town worth days. 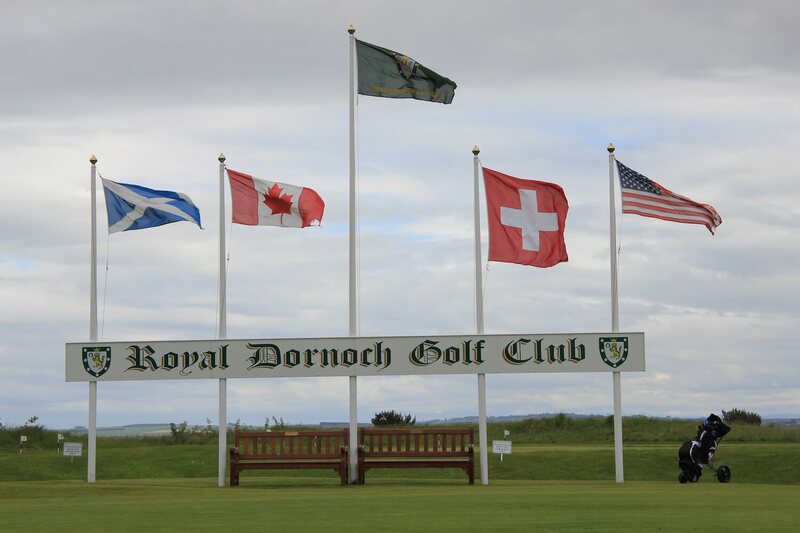 I also love Dornoch for its history. 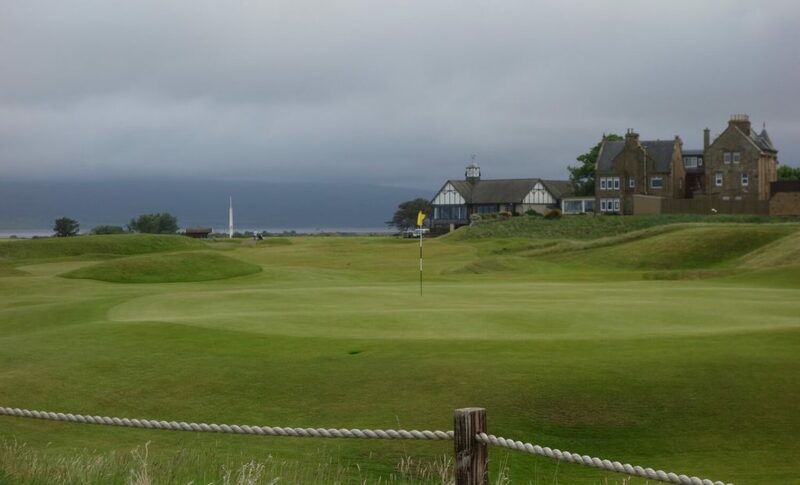 There is direct evidence that golf was played on the linksland at Dornoch as far back as 1616, but it wasn’t until 1877 that Dornoch Golf Club was established. In 1906 King Edward VII gave the club its royal status. In 1901 Andrew Carnegie (owner of nearby Skibo Castle) gave the club a silver shield as a trophy for a new competition. From the beginning the tournament – contested as the Carnegie Shield – drew the best players from the country. It’s still competed for today and it attracts high-level amateurs from around the world. All of those conditions made a perfect proving ground for local Donald Ross, who was born in 1872. 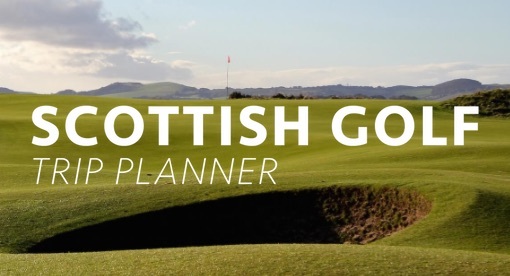 Following a stint as a carpenter’s apprentice in Dornoch, Ross went to St Andrews to learn clubmaking from Old Tom Morris (Morris also designed Royal Dornoch). Following a year at Carnoustie, Ross returned to Royal Dornoch in 1893 to serve as keeper of the green and head pro. 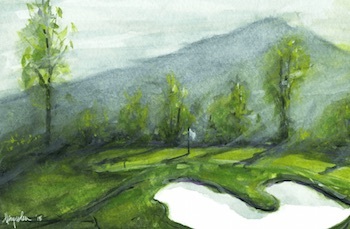 From there, Ross eventually moved to America where he had a prolific course design career, including my home course growing up in western North Carolina. 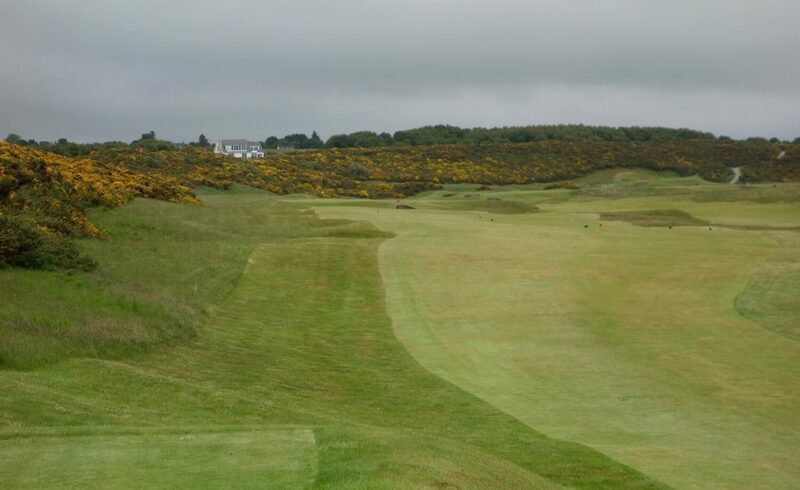 After playing Royal Dornoch you can see its influence on Ross’s future designs, particularly in the greens (something to note in the hole-by-hole section below). Hole #1 – 331 yards – “First” – The opening hole is straightforward, but it also provides the first taste of the crowned greens. Miss anywhere but short and you have a tough putt or chip back onto the green from a collection area. 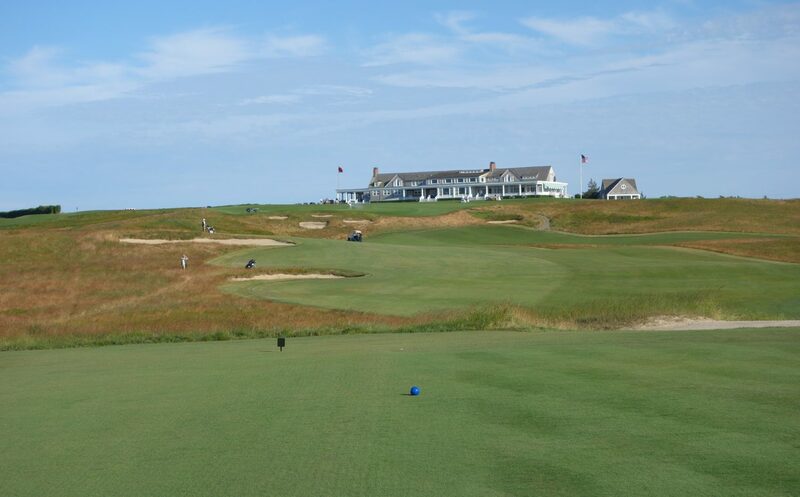 Hole #2 – 177 yards – “Ord” – This is one of the most famous and challenging holes on the course. The green is raised 10+ feet above the surrounding land and deep bunkers swallow the typical misses. Aim center green as you would at a place like Donald Ross’s Pinehurst No. 2! 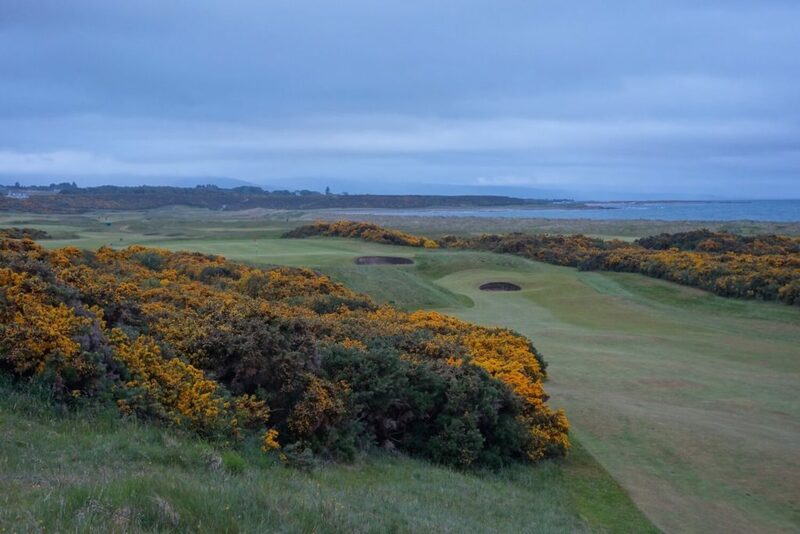 Hole #3 – 413 yards – “Earl’s Cross” – After emerging from the gorse, you’re struck with a view across the linksland at Royal Dornoch. 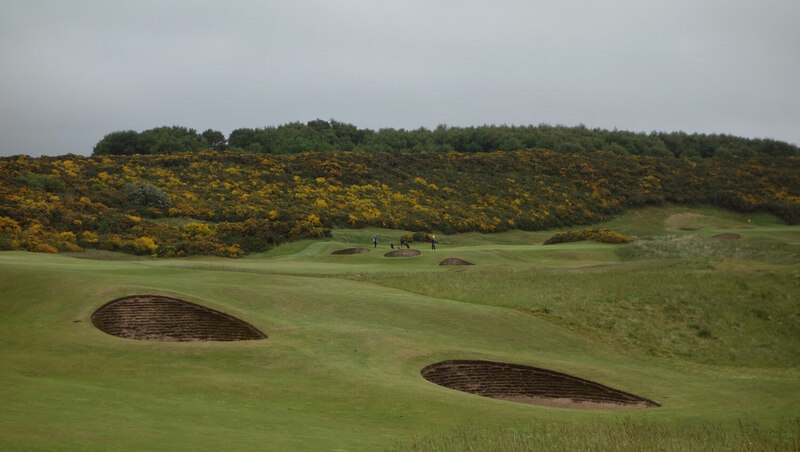 The 3rd hole hugs the left edge of the property and rough and four bunkers define the right side of the hole. 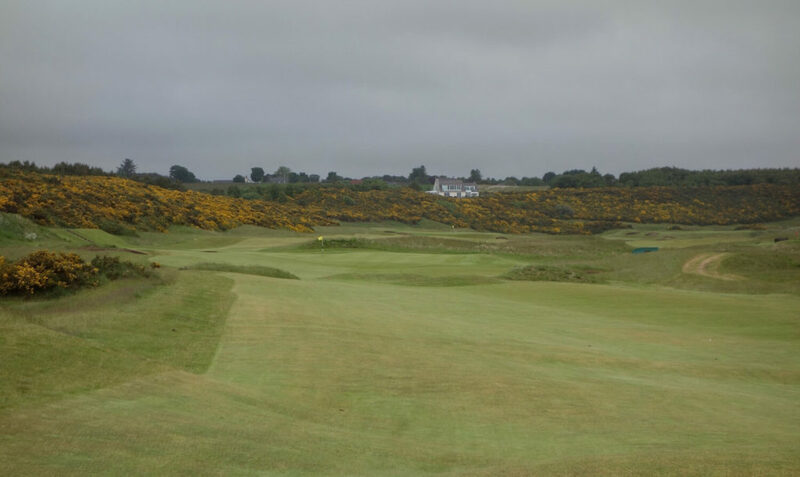 Hole #4 – 422 yards – “Achinchanter” – The 4th follows the gentle sweep of the left edge of the property, which is also framed by bright yellow gorse. 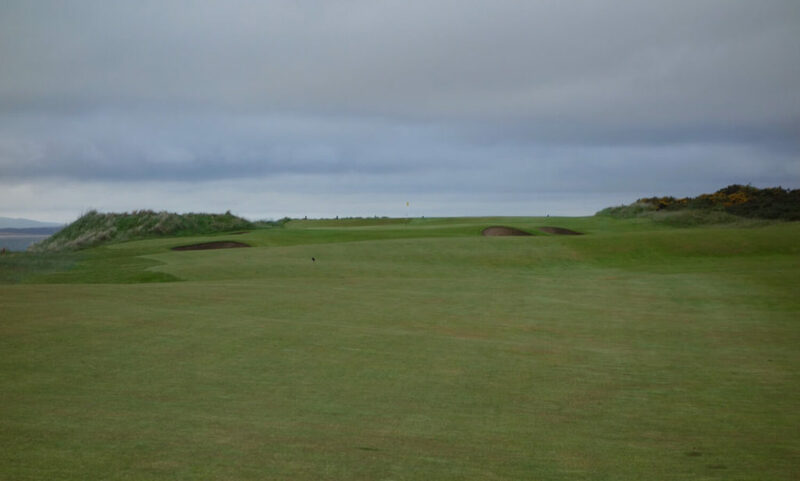 This green is another raised example with intimidating bunkers placed perfectly for the typical miss. The green is much larger than it appears, so aim for the heart and don’t be short. Hole #5 – 353 yards – “Hilton” – This is one of my favorite holes on the course, particularly from the elevated championship tee in the gorse on the hillside. The tee shot has an awkward angle that seemingly forces you to hit your ball at the right fairway bunkers. 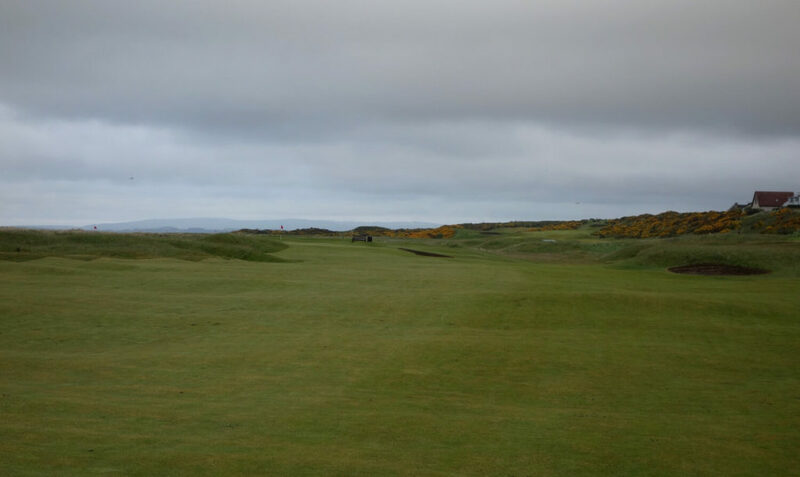 You have to avoid them, and from there the approach shot is to a green that works away and right from the fairway. The left side of the green has runoff areas and two hidden bunkers. Right features a big sloping collection area. There’s no good miss… but the hole is only 353 yards. 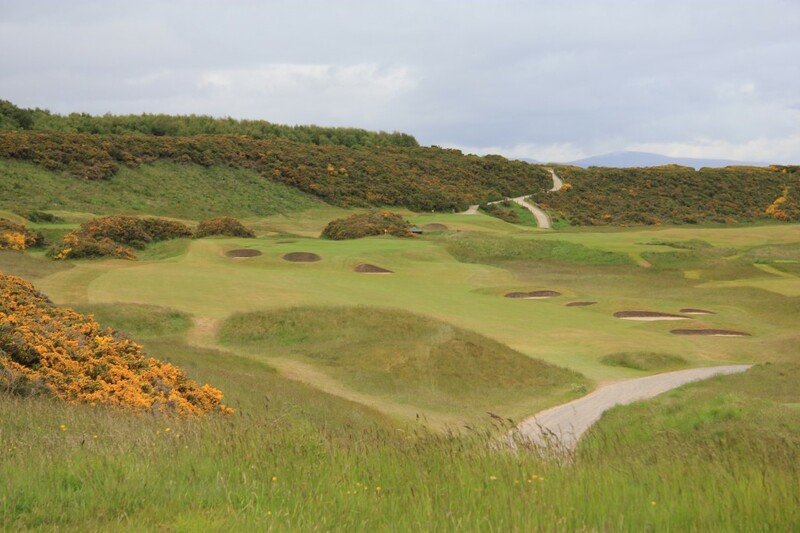 Hole #6 – 161 yards – “Whinny Brae” – This little par 3 is the source of endless amusement and frustration. The green is very narrow and small. Two bunkers sit in the hillside left of the green and a massive slope defends the right side of the green. Miss anywhere on this hole and par goes out the window. One of the best views on the course is found on the walk from six green to seven tee. As you ascend the hill you turn around to see most of the course laid out behind you with the expansive Dornoch Firth in the background. 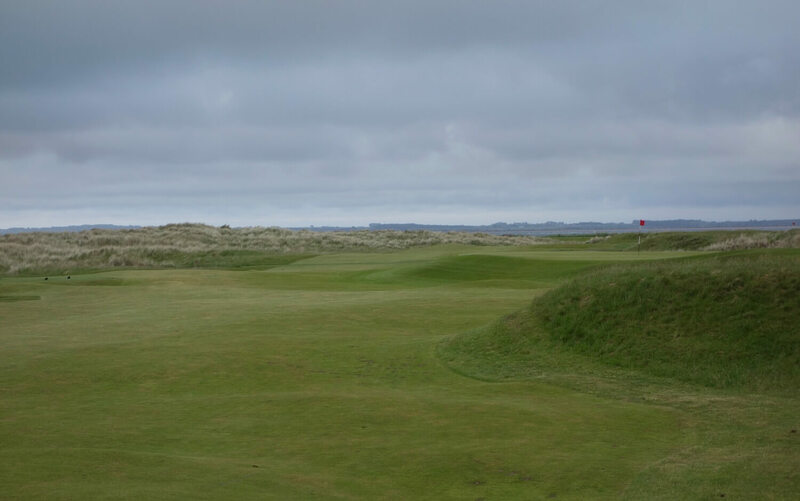 Hole #7 – 479 yards – “Pier” – This long straight hole appears easy due to its width and lack of hazards, but it’s on the highest and most exposed part of the course so wind is always a factor. Approach angle is also key depending on the pin position in relation to the two greenside bunkers. The 7th is undergoing some major changes that will be revealed in 2018. I haven’t seen them personally, but will update this post when more information is available. Hole #8 – 434 yards – “Dunrobin” – After the drama-less 7th, the 8th is the opposite. A semi-blind drive toward the aiming post is all you need off this tee. The approach is then steeply downhill to a well-guarded concave green at the far end of the property. The view from the aiming post is one of my favorite in golf. 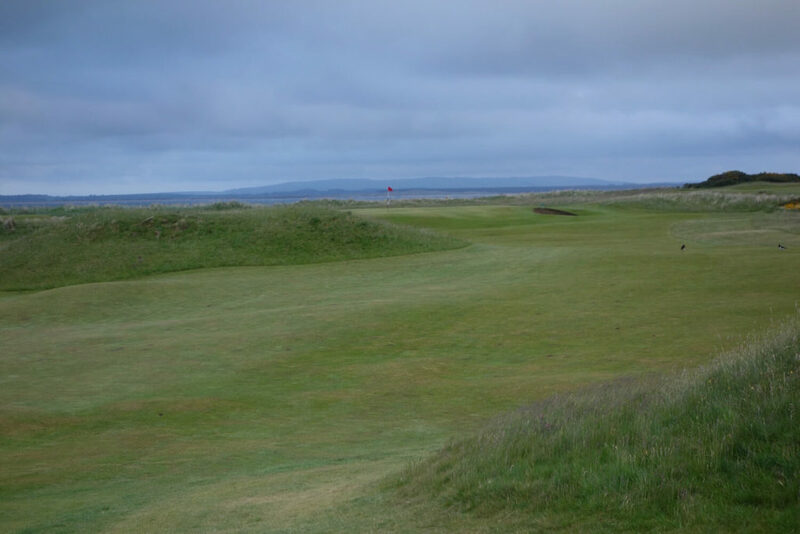 Hole #9 – 529 yards – “Craigliath” – The 9th hole spins back around and heads along the coast toward the clubhouse. 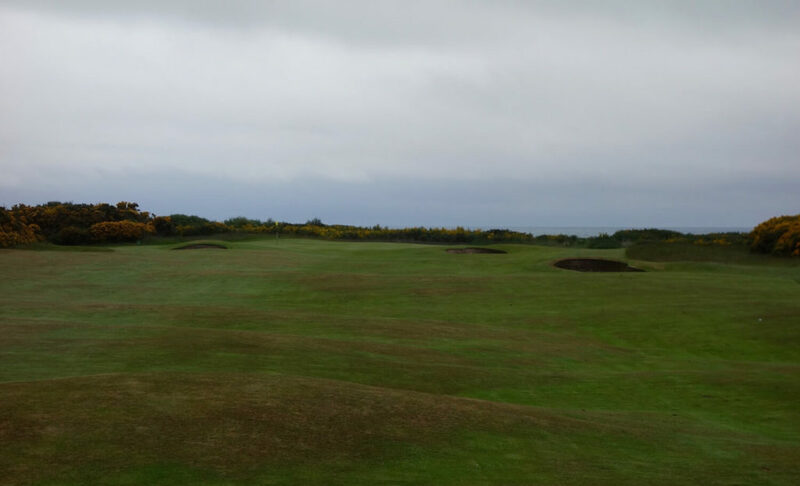 The par 5 hugs the coastline all the way to a raised green guarded by two very deep bunkers in the bailout area. Hole #10 – 146 yards – “Fuaran” – Yet another tremendous par 3 at Royal Dornoch that can, depending on the wind, be the trickiest on the course. Although it may seem that a downwind hole is always easiest, that doesn’t hold true on this hole (or par 3s in general). If you play the downhill 10th downwind, it’s almost impossible to hold this green. You have to carry the front bunker, but anything that lands on the green almost inevitably rolls off the back down a steep slope (see second photo below). I’d love to hear from some locals how they play this hole – leave a comment on the review! 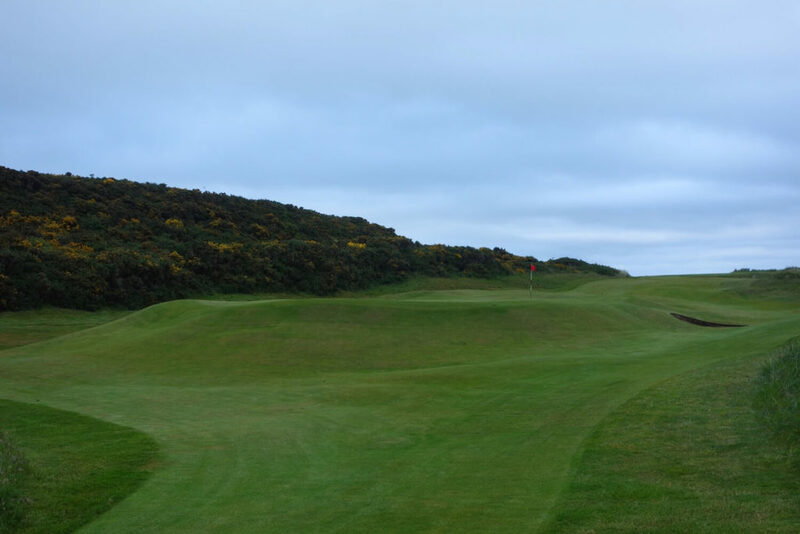 Hole #11 – 446 yards – “A’chlach” – This fairway has two tiers and the lower left slope kicks balls into the left rough. The pin position determines which side of the fairway leaves the best approach angle. The green has a large slope and collection area on the left, so focus on hitting the center of the deep green. 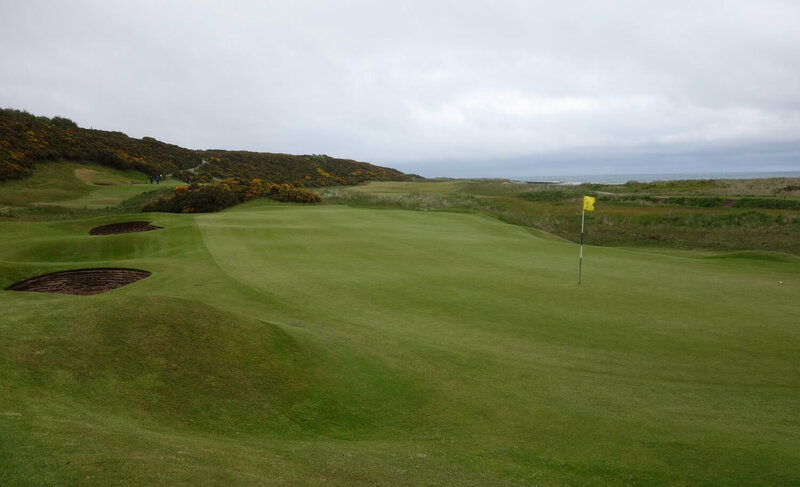 Hole #12 – 535 yards – “Sutherland” – The dogleg left par 5 12th hugs an area of thick rough and dunes that obscures the green. The key mistake you can make here is laying up down the left side, which leaves a blind approach to the green. The second photo below is taken from behind the green looking backward down the fairway. Hole #13 – 171 yards – “Bents” – The final par 3 on the course caps off four one-shot masterpieces. The well-bunkered green is initially intimidating, but there is actually more room to land a ball short and run it on than initially appears. That fact, along with the green being fairly large, means this hole’s bark is worse than its bite. Hole #14 – 445 yards – “Foxy” – This hole is a riddle I’ve never figured out. Raised dunes with thick grass run down the right side, drastically narrowing this fairway and cutting off angles and lines of sight from the right. It’s a tougher tee shot down the left, but the bolder play is rewarded with an unobstructed view of the green and a superior angle. 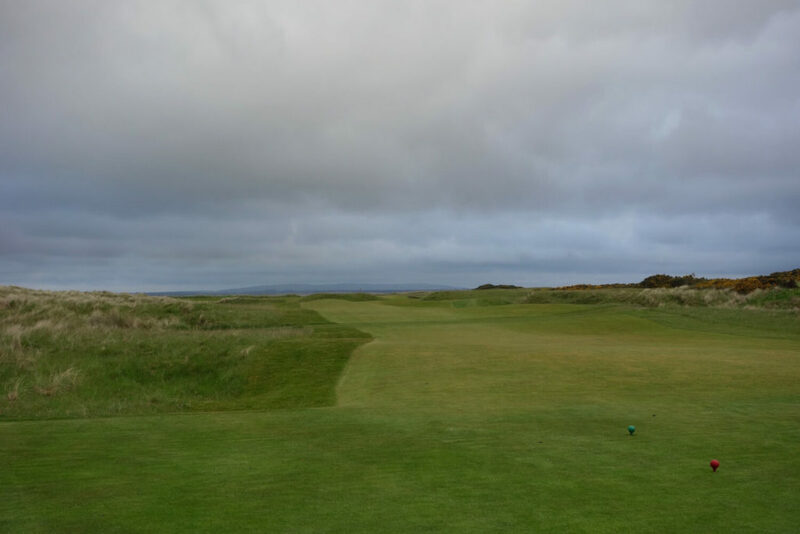 The green itself is raised above the fairway, but is large and mainly flat. 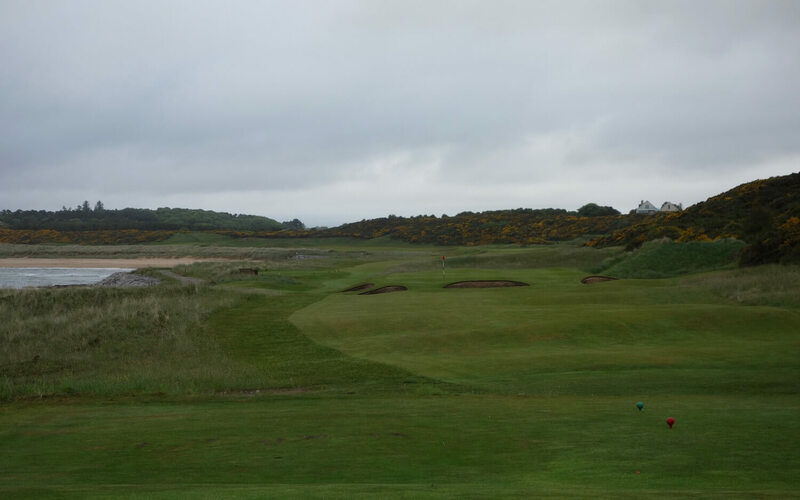 Hole #15 – 322 yards – “Stulaig” – This hole is driveable on a downwind day, but it’s tough to choose an angle off the tee, which sits left of the fairway in the dunes. A center line grassy mound in the fairway forces players to make decisions to avoid it and get a line of sight to the green. 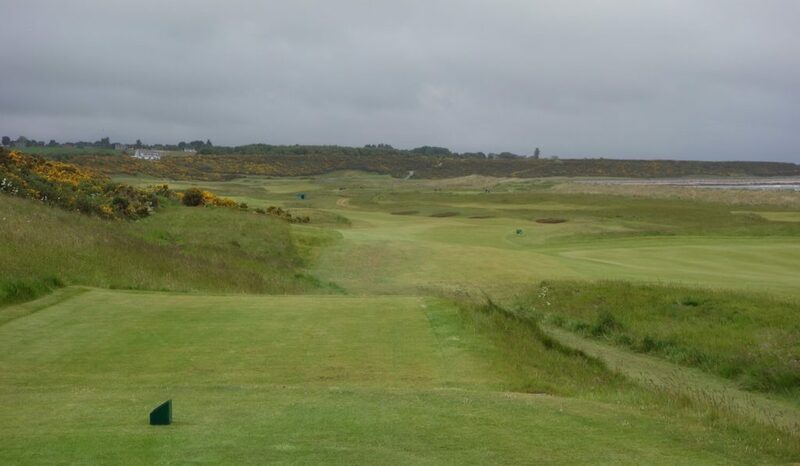 Hole #16 – 401 yards – “High Hole” – Working back uphill, the 16th plays straightaway to an exposed flat green. A single grassy mound sits short right of the green. Hole #17 – 405 yards – “Valley” – The light was fading fast at this point in the round, but the marker post is still clearly visible at the top of the hill in the first photo below. Most drives clear the hill and roll down to the bottom. From there, the hole takes a sharp left turn and plays blind to a green that sits in a bowl (look for the red flag in the second photo below). 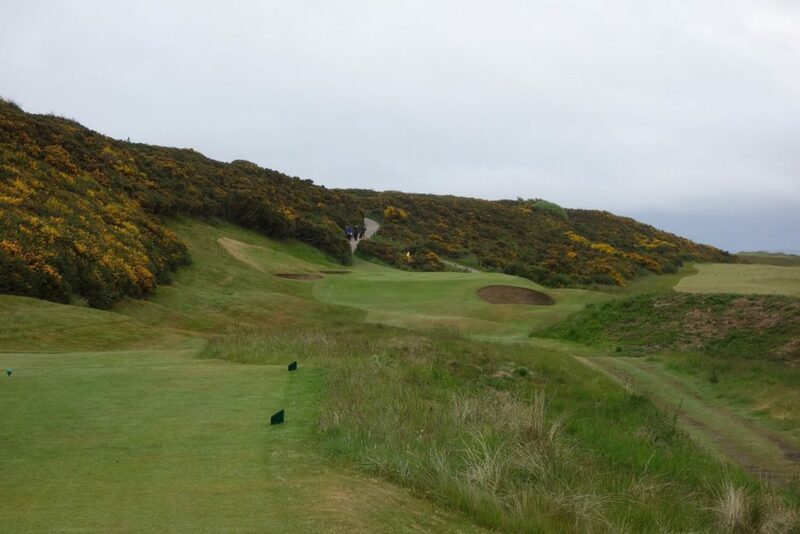 Hole #18 – 456 yards – “Glenmorangie” – The final tee shot plays through a corridor of gorse bushes and takes a slight right turn toward the green and clubhouse beyond. 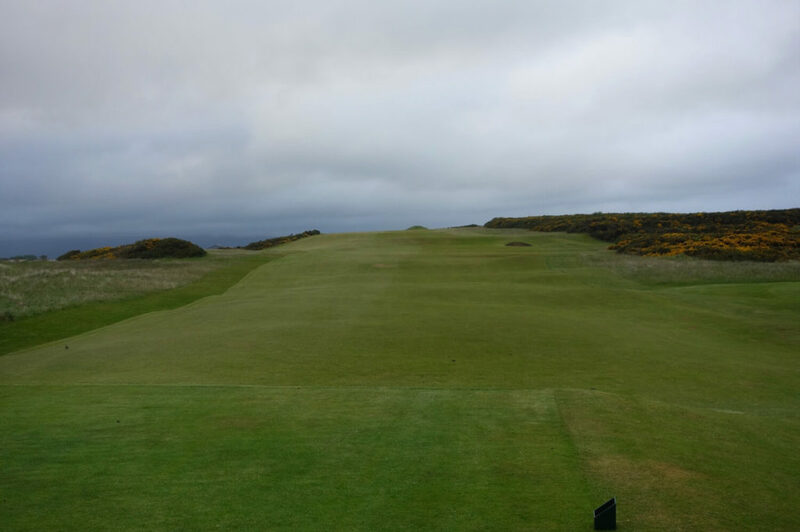 The last green is large with subtle undulations and less of the crazy runoffs and slopes seen earlier in the round. More than any other Scottish course I’ve seen, Royal Dornoch has the ability to capture people like the St Andrews Old Course. Golfers fall in love with the place and it draws them back for decades and golf trips to come. 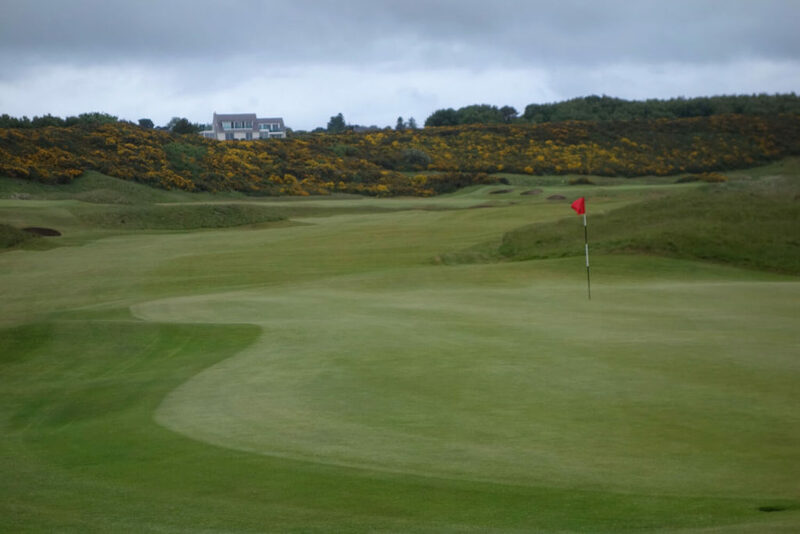 Just like St Andrews, the course and town flow together and share a single identity. The place has so much charm and its rural location adds to the effect. It’s like a pilgrimage getting up to Royal Dornoch and I can’t emphasize enough that once there you should stay and explore the Highlands! I am delighted that you enjoyed playing our course but disappointed that you had a couple of negative experineces. If you email me at neil@royaldornoch.com we can discuss how this can be resolved. These guys offer some great stuff as well, found they really do specialise in the right areas! 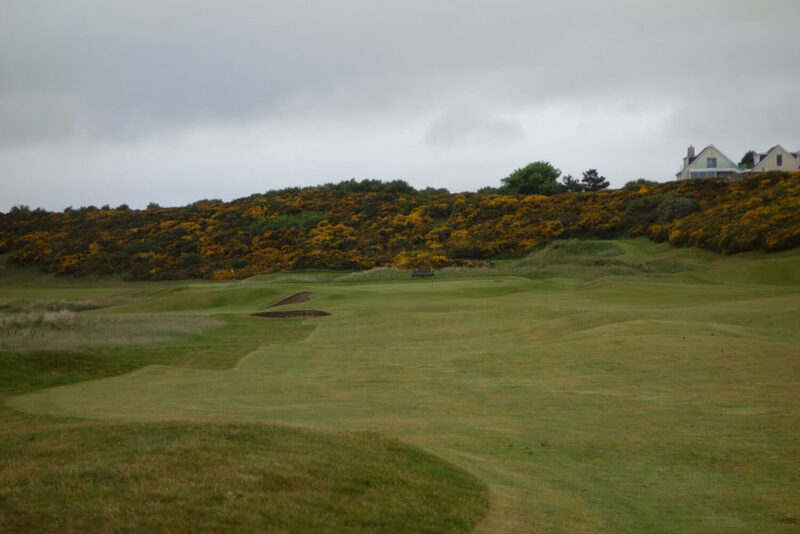 What you experienced at Dornoch is an unfortunate aspect of the character of a certain kind of Scot. It drove me nuts when I lived there (born and lived in Edinburgh for first 30 years). It’s an obsession with rules and conventions. It affects their relationships with each other, and with clients and customers from away. I could tell you stories! I hope they put it right. As always, another great write-up. 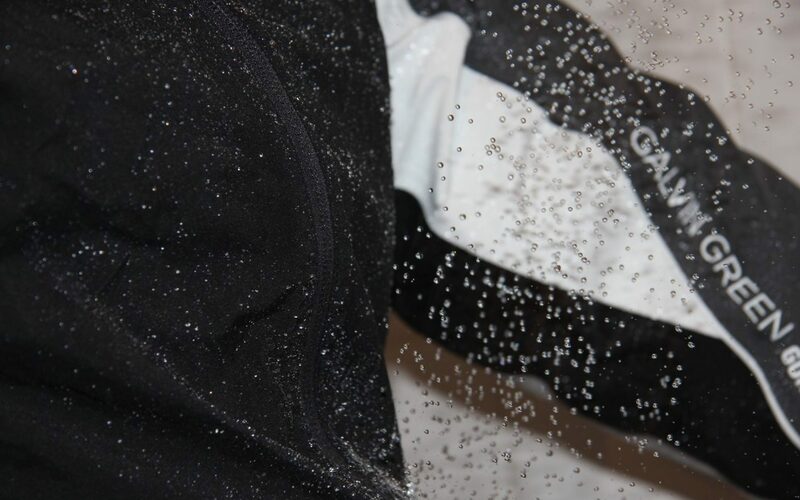 Thanks for sharing your experience and wonderful pics! I’m curious as I’m trying to plan a twilight round at Royal Dornoch as well, how long did your round take? From what I gather in September I’d have about 3 hours of daylight from the time I teed off at 5pm. Thanks Jason! I’m glad you enjoyed the review. Our twilight round didn’t take too long at all. We played in about 3 1/2 hours with my stopping to take constant photos, messing around in bunkers, hitting multiple balls etc etc. You won’t have too much time to stop and smell the roses, but I’d imagine you’ll finish up without any problems! 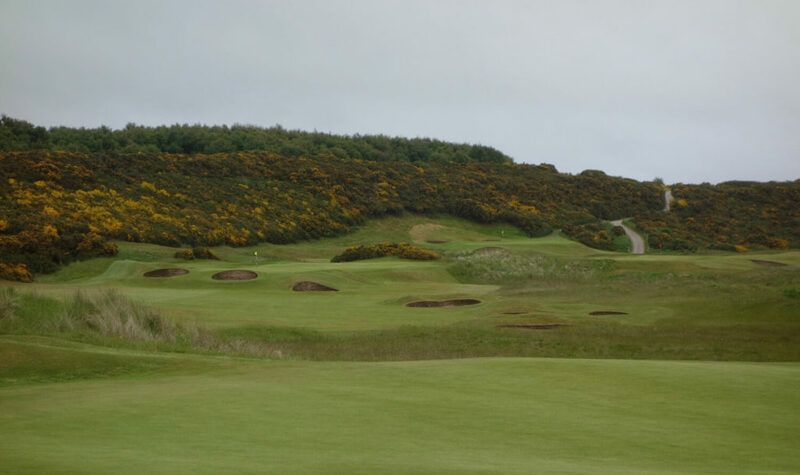 I thoroughly enyoid playing Dornoch and agree it must be one of the best courses on this planet. However I also encountered a weird situation with the staff. My wife and daughter were to pick me up and arrrived a bit early, so they thought they could have a tea while waiting. In an otherwise almost empty restaurant, the staff asked them to leave as only members or paying guests were allowed in. 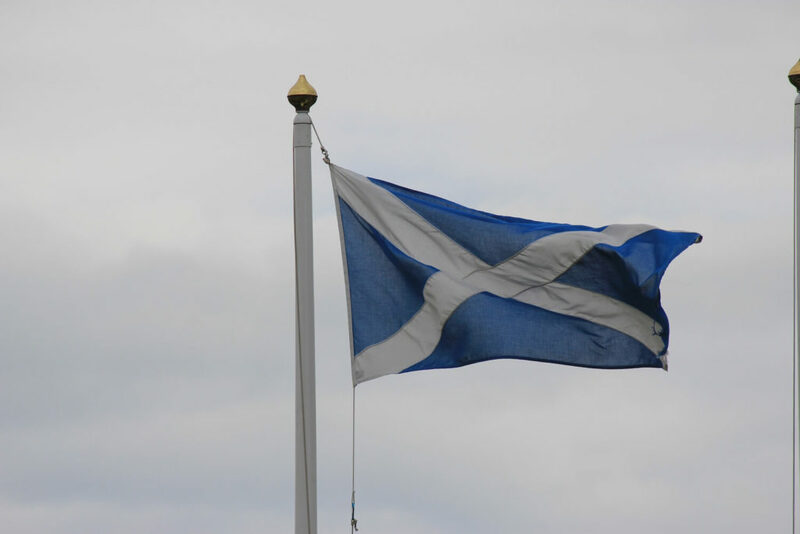 I found this quite unusal for Scotland, and when I consider the extremely warm welcome you experience even in St Andrews, also quite out of place. The course is a must play, anyway! Hi Lars, Thank you for taking the time to comment! That’s very odd about your wife and daughter being asked to leave the restaurant… Like you said, it’s not something you would expect at all from a great Scottish club. There’s no good excuse for that. Despite the bad staff experiences, the course sure is awesome – it’s a shame that their is a “black eye” of sorts on the day. We’ll both have to return and give them another shot! Thanks for the great review Graylyn. 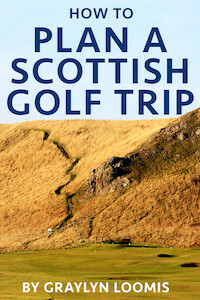 Has been very helpful, along with your others, in helping craft the golf trip of a lifetime from the other side of the world. 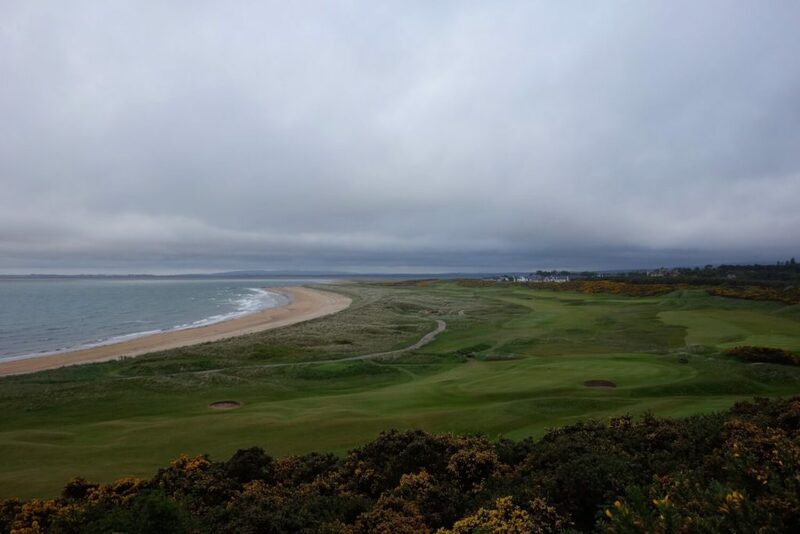 Quick question – would you recommend staying in Dornoch itself or down in Inverness? Planning on a couple of rounds on consecutive days. Cheers. Hey Andrew, thanks for the comment! I’m very glad to hear that the site has been helpful. 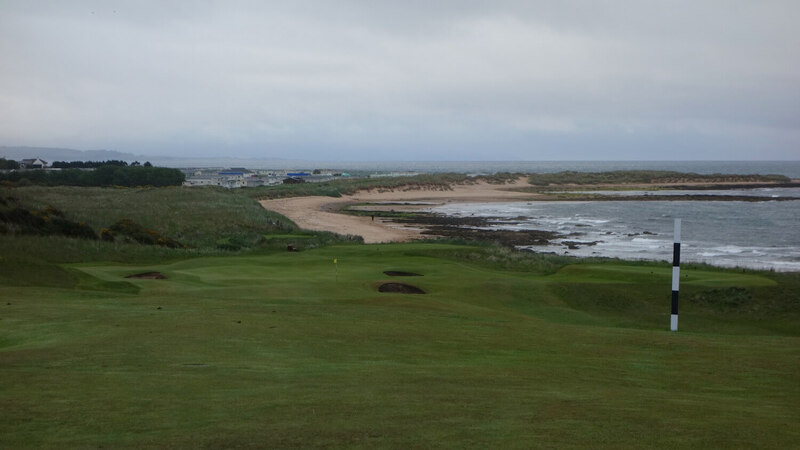 I’m jealous of you going to Dornoch… it’s such a great place! 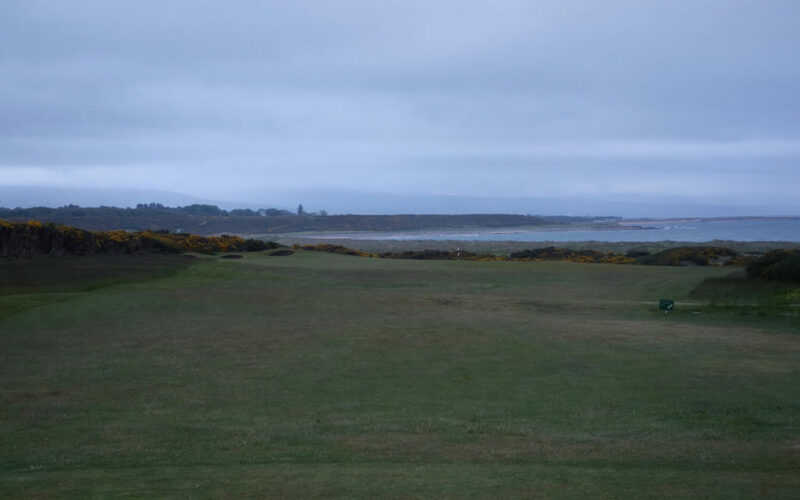 My personal preference would be to stay in Dornoch itself. I stayed in a B&B while there, but there are a number of hotel options very close to the course, most famously the Royal Golf Hotel. The town has a ton of character and exudes golf – some would say even moreso than St Andrews. 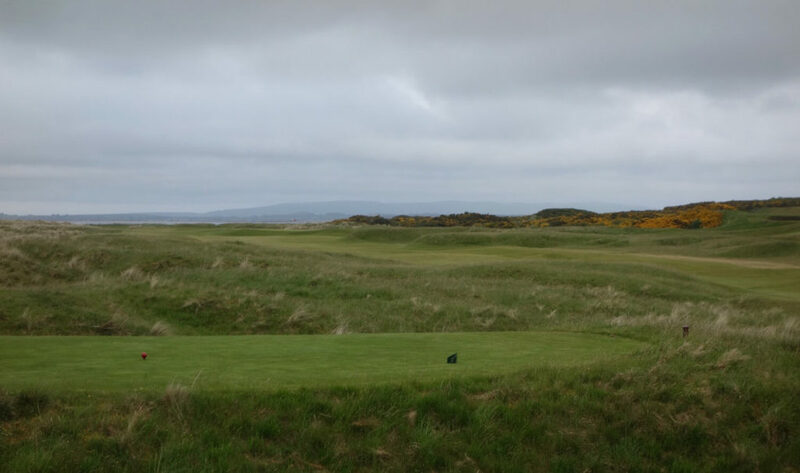 The drive down to Inverness is right at an hour, so unless you will be playing Castle Stuart (or another Inverness course) multiple days in a row, I vote staying in Dornoch! Excellent – thanks again for the great recommendations! Not enough time for Castle Stuart this time round unfortunately, but hoping to return one day when the new Mike Keiser course is well established. Cheers. In that case, definitely stay in Dornoch. You guys will have a blast! 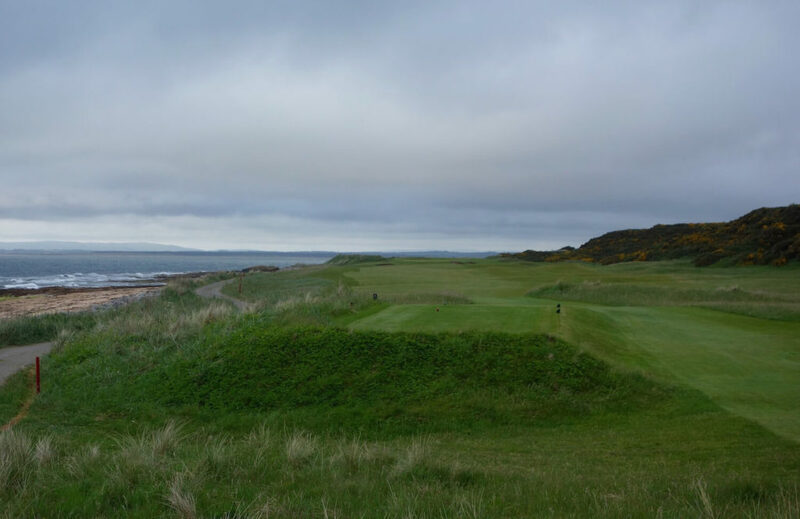 If choosing between Dornoch or Castle Stuart, you’re making the right choice. I’m going to make it back for the new Keiser course as well… see you there! 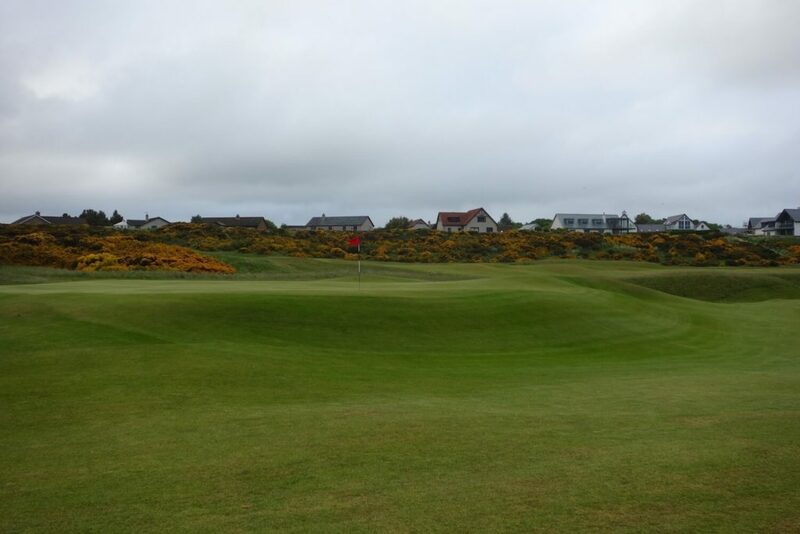 Rick’s article — https://www.si.com/vault/1987/08/17/115930/unseen-hands-on-my-game-a-week-at-royal-dornoch-in-scotland-is-a-golfers-dream-but-the-author-found-it-a-haunting-experience — while dated with its references, is still a magical read. 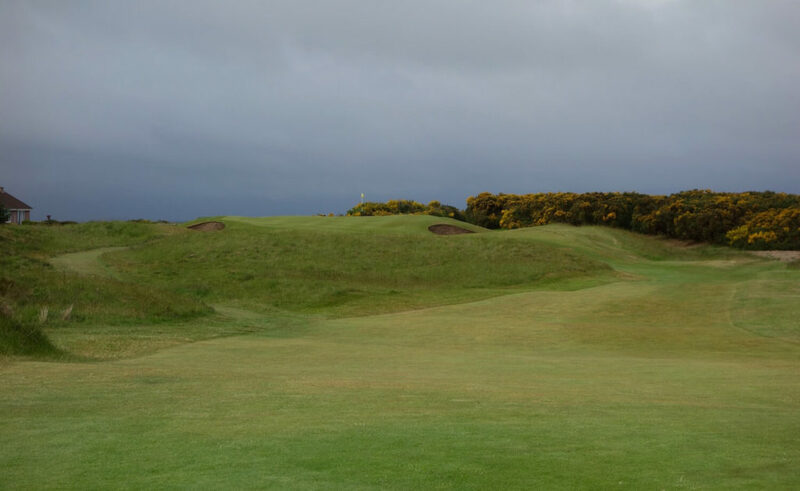 Though I’ve never visited Royal Dornoch, your descriptions and pictures SO make me want to, Graylyn. Thanks for another fine review! Your reviews and website have helped enormously. Hi Dave, congrats on your 50th! That will be a great way to celebrate with you friends and I couldn’t be more happy that the website helped with your planning. Let me know how it all goes when you get back! Hi Robert, you’re doing it right this upcoming trip! Once you’ve made all of the effort to get there it’s worth taking a few days to explore the area. Let me know what you think of the place 30 years later! Love reading about this course. Played it in August ’95 with a group of seven friends. Can’t wait to go back again. We played a browned out course during a drought. 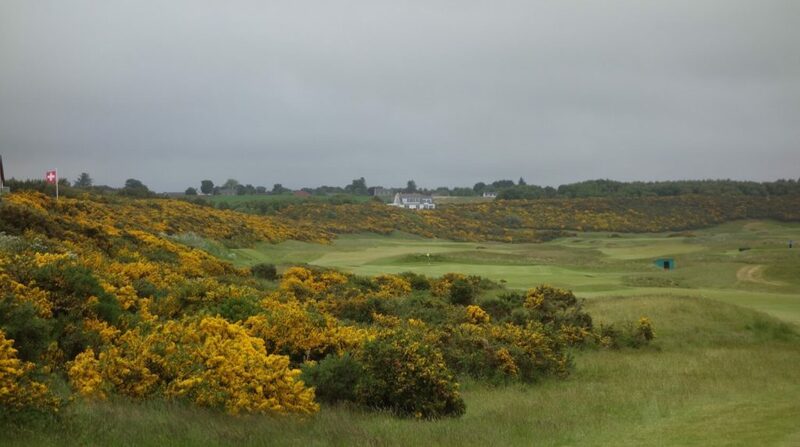 Love to go back when the gorse is in bloom. Which months is it blooming? 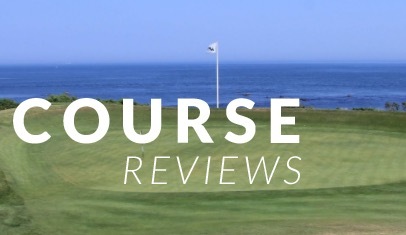 Thanks for the review – I have played Dornoch 4 times in the last 5 years – a great experience. 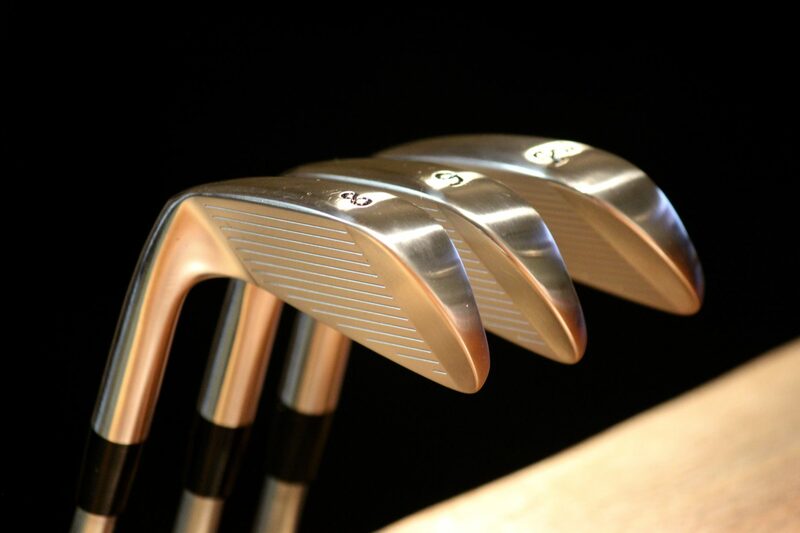 I have always found the staff extremely welcoming and chatty – the Pro Shop is often a trifle cool, but always professional. 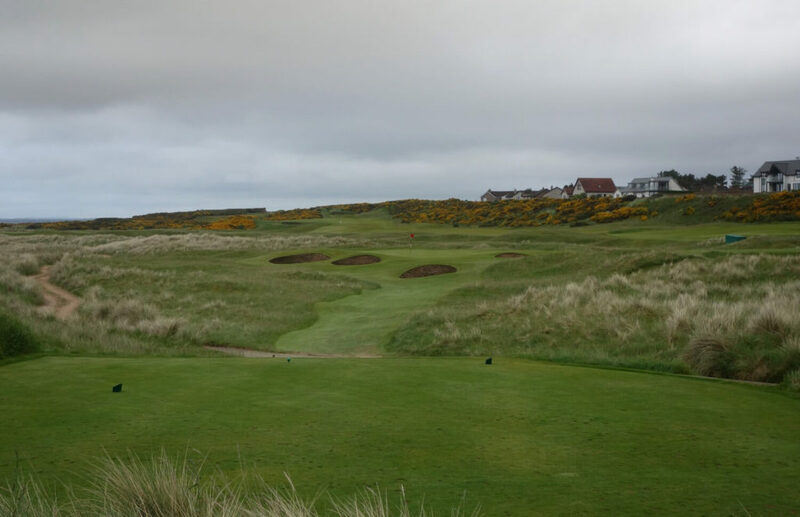 Keep up the great reviews – can I suggest Cruden Bay next! Hi Thomas, Thank you for the comment and tip about the B&B – sounds like a great place to stay. 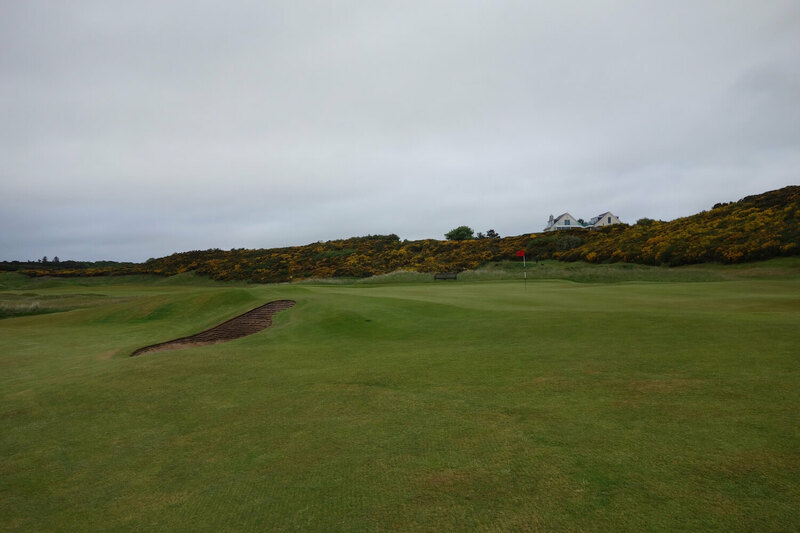 I am playing Royal Dornoch In July and this write up and pictures will help me a lot. I have been wanting to play for many years on our annual tip to Scotland. This time we are playing as well as Royal Aberdeen so will see which is the one we enjoy the most I am sure we will enjoy both.